Lakshmi Canteen: Cornmeal Idli and Two Years of Blogging!! Coming back to my recipe- Cornmeal Idli. This recipe is similar to my Rava Idli post. I got this recipe from here. I was totally impressed by her recipe (she has a good collection of video recipes). Never knew that we can make idlis using cornmeal. I made slight variations to the original recipe and the idlis turned out very tasty. Indeed a filling breakfast :-) Do try making these yellow beauties and enjoy!! *You can substitute semolina(rava) for cornmeal, if you can't find it. Chop green chilli, cilantro and grate ginger. Heat oil and add mustard seeds. Once it starts spluttering, add chana dal, urad dal, chopped green chillies, grated ginger and curry leaves. Fry until chana dal and urad dal turns slight brown. Once it turns light brown, add cornmeal and fry it until a nice aroma is got. This step might take 3-4 minutes. Cornmeal has to be constantly stirred and heat should be medium. Once a nice aroma is got, turn off the heat and add chopped coriander leaves. Allow it to cool. Once it cools, add yogurt, water, salt. Mix well. Let this mixture sit for half an hour. 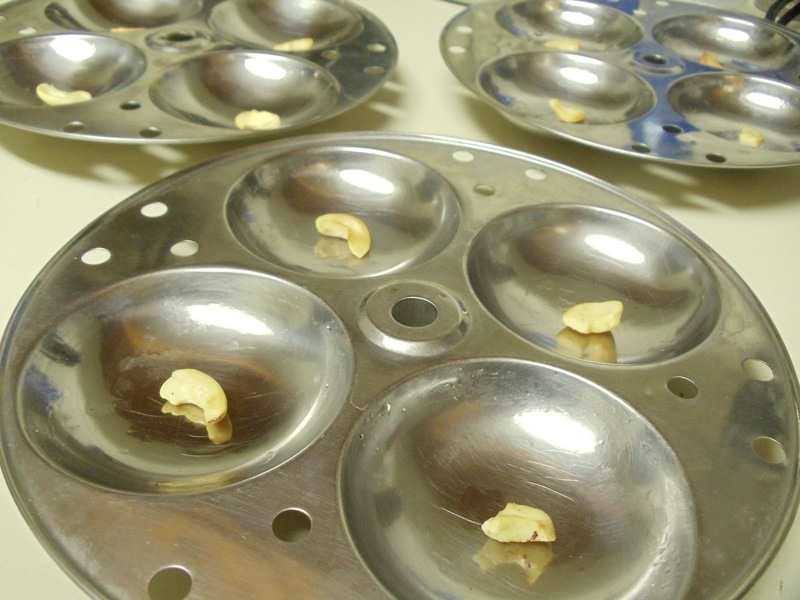 Now grease the idli moulds with oil and keep the roasted cashew in each small mould. Now add the eno fruit salt to the batter and mix well. Then start putting the batter in each mould (fill upto 3/4 th of it). Stack them up and steam it for 15 minutes. Then allow it to cool for 5 minutes and then remove the idlis from the moulds using a spoon. Serve it hot with Coconut chutney or mint chutney. I served it with Sambhar. Above measurement makes 13 medium sized idlis. I want to find cornmeal, where can I look for it? does it go by any other local name? Hi,I'm from brazil and do not have a idli stand.what else can I use for idli mould. Hi monika, you can use a stainless steel plate with high sides which fits in your steamer. Just grease it and pour the batter and steam for 15 min. Hope this helps. Let me know if you have more questions. Sorry the delayed reply.